CD207 (Langerin) is an antigen described as selectively expressed by Langerhans cells (LC), a subset of immature dendritic cells (DC) formed in epidermis and mucosa. Langerin is a 40 kDa glycoprotein predominantly N-glycosylated which contains no disulfide bond. Its expression, restricted to the Langerhans cell lineage, is demonstrated at both the surface membrane and in the cytoplasm. Several lines of evidence indicate that Langerin is a marker specific for the acquisition of the Langerhans cell phenotype. It is down-regulated beyond the LC maturation stage. Langerin is not involved in antigen delivery into the MHC class II pathway but may play a role in antigen capture. Langerin is present only in epidermis and airway epithelia. Langerin is not detected in purified DCs isolated from peripheral blood, lymph nodes or thymus. CD1a+ DCs derived from CD34+ cord blood cell cultures in the presence of GM-CSF and TNF-α express Langerin between day 8 and 12. DCs derived from peripheral blood monocytes cultured with GM-CSF and IL-4 do not express Langerin. Clone Description The DCGM4 antibody stains exclusively immature DCs of the LC lineage. Both intracytoplasmic and surface membrane staining is observed. DCGM4 acts as a ligand for Langerin, triggering rapid endocytosis within 20 minutes at 37oC. The antibody has been used in intracellular immunofluorescence analyzed in confocal microscopy. 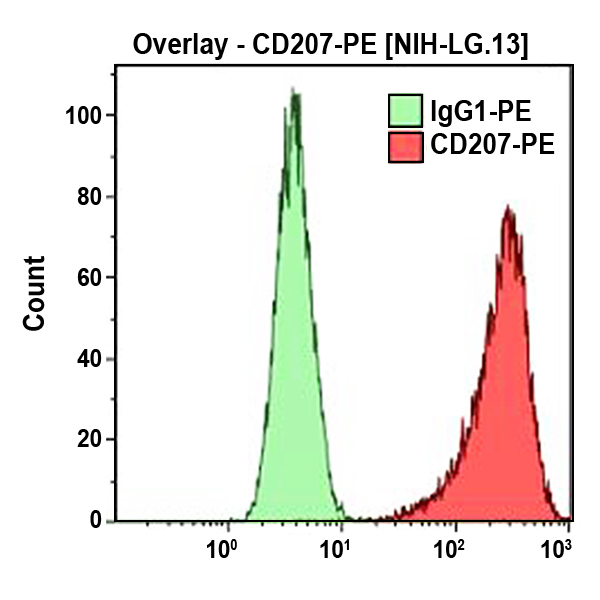 The DCGM4 antibody has been used to determine the differentiation of the CD1a+/CD11c+ subset of blood DCs into LCs, and in the characterization of DCs infiltrating breast carcinoma tissue.